Update: If you tried to enter Sherrie's giveaway but couldn't get the comment form to work, try the new link below! My first contact with Sherrie Shepherd was through her blog. I think I found her through Motherboard, but I don't remember for sure. My first contact with her music was when I was looking for something to use on my book trailer for Tower of Strength. Bingo. It was perfect. I became an immediate fan. When my copy of the CD arrived the other day, I popped it into the CD player. No joke here: within seconds, all four of my kids were gathered around, sitting on the floor, listening intently. My son went on about how he wants to learn to play them all. He also wants to put the songs onto his iPod. Next child down, a daughter, said the same thing about wanting to play the music herself (she might be a couple of years away from that level, though). 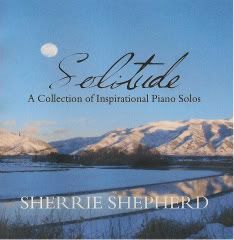 I promised that when Sherrie releases a book with all the sheet music, we'll be sure to get a copy. Next daughter raved: "That is so pretty, Mom! Let's listen to all the songs." (She then proceeded to look over the list and keep changing the one we were listening to. "Let's try this one! Okay, now this one!") I had to stop her and say, "Let's just listen to the whole CD straight through, k?" Meanwhile, my youngest was happily swaying to the music. She's six, and even she was enthralled. Let's just say it was a hit in the Lyon household. Sherrie's doing a blog giveaway where you can get up to NINE entries. So hop to it! If you win, give the CD as a gift. Because you know you're going to want to BUY one for yourself anyway! Love Sherrie. Love this cd. I'm so lucky to have won one already, so I'm saving up my $$ to buy some more as gifts. Her CD is amazing. She is so talented. That was a pretty piece of music for sure. Sher is very talented!! She is very talented. I agree totally with the choice for your trailer, it fits so nicely. You are a good fan! I'm dying to get her CD...she's amazing! I'm going to have to check out her music. Thanks for the tip! I got my new grammar book a couple days ago!! :)Thanks for writing it, you rock! I don't know if it's just me, but I tried to leave a comment for the CD giveaway at Sherrie's blog and couldn't. Rachelle, Thanks for letting me know--I'll pass that on to Sherrie so she's aware. Yeah for Sherrie! I love her music. I need to get the CD for our family. Beautiful! Thank you so much! I'm so happy your family likes it! It always feels good when I hear peole love my music. YOU are right... it IS awesome... I can't stop listening to it! I'll check it out. Thank you! Love, love, love your grammar book!! !